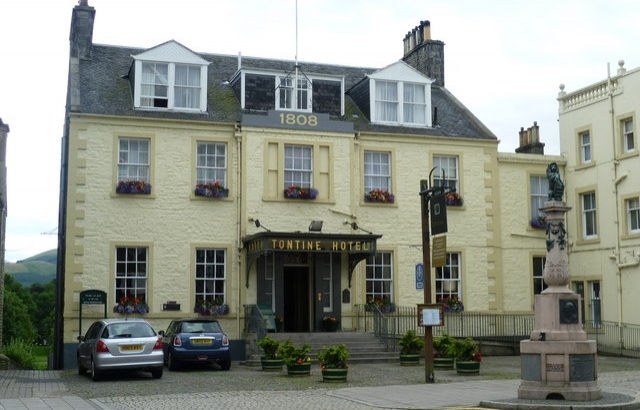 The Tontine Hotel built by French prisoners of war in 1808 is located in the heart of the historic and charming town centre of Peebles in the beautiful Borders of Scotland. A great place to visit and relax or wonderful base to explore the surrounding area. The local knowledgeable staff at the hotel are on hand to help you with your choice of activity from walking to cycling, fishing, golfing. There are many Abbeys and Castles within easy reach, including Neidpath Castle in Peebles itself, a truly romantic place to visit also with a sinister past! The nearby Traquair House is Scotland’s oldest inhabited house with more than 1000 years history. If you just want to relax and take it easy, relax in one of the hotels well-appointed and more than comfortable bedrooms and chill in front of the roaring fire as you sink into a comfortable sofa in the Callants Lounge. You can indulge yourself with a slice of home-made cake, before taking a stroll on the high street where you’ll find a range of quality local shops selling interesting and quirky gifts and items for your home. The bistro restaurant and the ‘wow’ of The Adams Restaurant is where you can tuck into some hearty comfort food or allow the Chef to cook a more refined dish from his daily recommendations, locally sourced wherever possible. Close enough to Edinburgh, Glasgow and Newcastle, the Tontine Hotel is a great place to visit and re-charge those batteries.